Event reminders are notifications sent by email to remind you of an upcoming event. Event reminders are available only to users logged in with a Teamup user account. You can create event reminders for single events, or for a sub-calendar. If you create an event reminder for an entire sub-calendar, you will be notified of all current and future events on that sub-calendar. For sub-calendar reminders, there are two types of reminders you can set up: Event Reminders section sets reminders for time-specific events, and the section below it, All-Day Event Reminders, sets reminders for all-day events. 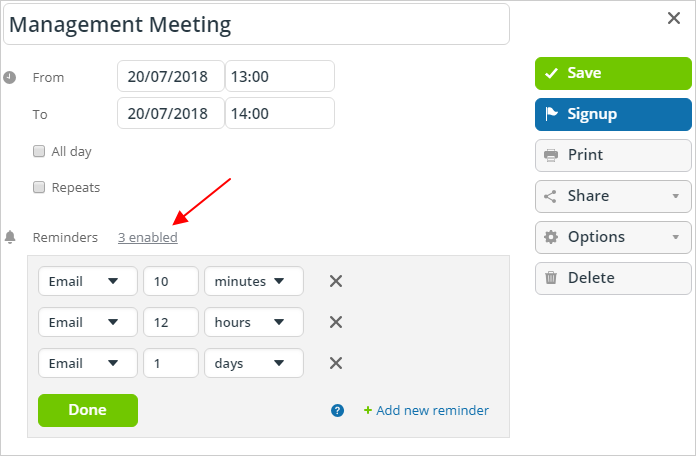 Currently, event reminders are only supported on the web calendar, and are delivered by email only. Support for reminders on mobile apps will be added in the future. More delivery options will be added in the future, as well. « What are iCalendar feeds?